Hi everyone, this is an updated sales thread for my ultralight down quilts, following on from the previous thread. To order a quilt please send me a private message through the forum or post to this thread requesting I contact you. I also have a thread for listing pre-made in stock quilts here. Thanks everyone for your continued encouragement and support! The quilts are shaped to effectively wrap around the human body with the shell and liner each formed of three main fabric panels. Vertical/longitudinal baffles which prevent down shifting to the edges of the quilt as the user moves during the night. Full length differential cut where the outer shell material is cut wider than the liner. This helps keep the down evenly lofted when the quilt is wrapped around the user. Elastic pad strap system that helps keep the quilt tucked under you when you shift around in the night and is adjustable to allow a varying amount of room, for example to allow wearing of big insulated clothing. Uses flat buckles that generally can't be felt by the user. Double snap button top closure and elastic drawstring to close the top of the quilt. The drawstring exits at the edge of the quilt, behind the neck/head, keeping the tail of the drawstring out of your face. Top draft collar that extends beyond the drawstring channel and acts to block drafts and increase comfort when the drawstring is cinched up. Footbox options: choice of either a zip and drawcord footbox or a sewn in footbox. The zip and drawcord option can be closed to form a footbox similar to the sewn in footbox option and can also be fully opened like a blanket. This offers more flexibility over a range of temperatures with the ability to have the quilt opened or to ventilate the feet in warmer conditions. An insulated draft blocker pillow plugs the small hole that remains when the drawcord is cinched. The extra down bunched up at the feet when the drawcord is cinched closed makes this footbox as warm in practice as the sewn in footbox. Adds approx. 15g (0.5oz) compared to the sewn in footbox. The sewn in footbox has an oval shaped end piece and is fully baffled for maximum warmth. Offers simplicity and is approx. 15g (0.5oz) lighter than the zip and drawcord footbox. Both footbox options give the same overall quilt length when the zip/drawcord footbox is closed and both footbox types are approx. 43cm deep and have a snap button to close the footbox up further when desired. A -8C Acai Purple and Cadmium Yellow quilt with zip and drawcord footbox. The inside of the quilt and the quilt opened in blanket mode. Construction details and the footbox cinched closed with draft blocker. The top collar can angle inwards when the elastic drawcord is tightened so that it blocks cold drafts without needing the drawcord pulled too tight. The oval foot piece on the sewn in footbox. the straps go around your sleeping pad and buckles on the straps mate with buckles sewn to the edge of the quilt. The straps are elastic and will expand to fit a large pad while still working with standard width pads, the strap should be slightly stretched when around the pad to help it stay in place. If the straps are too loose you can simply tie off a small section to shorten the strap, place the knot just off the edge of your pad so you can't feel it. The buckles on the straps can be moved inwards to wrap the quilt more tightly around you or outwards to give more room, either for comfort or to allow room to wear insulated clothing. A bit of experimentation is in order to find out your preferred way to use the straps. Some prefer to clip in fully while others like to clip in on one side and have the other side free and others don't use the straps at all. Showing how the buckles attach the quilt to the pad straps. Inside of the quilt with the clips done up. Down options: there is a choice of 800 fill untreated goose down, 850 fill HyperDRY water resistant duck down or 950 fill HyperDRY water resistant goose down. The HyperDRY down resists getting wet for longer than untreated down, retains less water if it does get wet and dries faster than untreated down. This gives an extra margin of safety if by accident your quilt does get wet and can also provide an advantage for multi-night trips in damp areas or conditions with heavy condensation. On the other hand untreated down has been used successfully for decades and will provide the same performance in many situations. 15 denier (15d) micro-ripstop fabric, ~33gsm Primarily intended as a shell fabric, has a substantial feel for the weight and is soft and smooth enough that it could also be used for the inner lining of a quilt. 10d taffeta fabric, ~23gsm. Very soft and smooth and ideal as the quilt inner lining but also has excellent wind and water resistance so can be used as the shell fabric for a saving of about 25g if minimum weight is a priority. 15d taffeta fabric, ~31gsm. Just as soft and smooth as the 10d taffeta and ideal as a slightly more substantial quilt inner fabric (adds ~20g compared to a 10d inner). Can also be used for the quilt shell if a colour combo with this fabric is desired. Bottom row: 15d micro-mipstop: Burnt Orange, Red Ochre, Acai Purple, Royal Blue, Macaw Green, Rainforest Green and Grape Leaf. Length: 183cm (72") for sewn footbox and zip/drawcord footbox when cinched closed, 196cm (77") with zip/drawcord footbox when open. Suits users up to 183cm (6'), reaches the nose of someone who is 183cm tall. Temperature ratings: ratings of +4°C, -2°C and -8°C will be available as standard. These ratings have been determined by my own experience and careful comparison with the specs of other products on the market, they also assume an average male user wearing thermals with sufficient head insulation and a sufficiently warm sleeping pad. Lead time is usually around 4 weeks but could be longer depending on the order queue. If you have a deadline for a trip then let me know, I might be able to accommodate a faster delivery time (or if you need a quilt quickly then have a look at my in stock and ready to ship listings here. All quilts come with a stuff sack and storage sack as well as the elastic pad straps. A pair of pad straps weigh ~20g and the stuff sack weights ~14g in addition to the quilt itself. Postage within Australia is a flat rate of $14 for one quilt, contact me for overseas postage or multiple quilts. Overfill is available at $8 per 25g for the 800 fill down, $10 per 25g for the 850 fill down and $20 per 25g for the 950 fill down. Payment is by bank deposit, 10% deposit to confirm the order and the balance + postage before shipping. Happy to answer any questions related to the quilts and happy for anyone to come and have a look if you can come and visit me near Maroubra in Sydney. Last edited by undercling-mike on Tue 31 Jan, 2017 8:27 pm, edited 4 times in total. Further fabric options: I've still got some stock of the previous fabrics I was offering so they will remain available while stocks last. In terms of performance the Argon 90/Illume 15, HyperD 1.0 and my new 15d micro ripstop have very similar performance properties in terms of breathability and water resistance with the Argon 90 slightly more breathable than the HyperD 1.0 and my new fabric right in between the two. The Membrane 10 fabric is almost indistinguishable from my new 10d taffeta fabric while the Argon 67 is more breathable and all three have a very soft feel. Printed fabric: The range of fabric prints available from Ripstop by the Roll (https://ripstopbytheroll.com/collections/outdoorink) will be available as an option. The printed fabric is membrane 15, a 15d polyester taffeta fabric with a soft and smooth feel that can be used for either the shell or liner (add 25g if used as the liner). There will be an extra cost of $70 for this option and a longer lead time as the fabric will need to be ordered separately. Here's an example of the printed fabric: The shell fabric is my new 15d micro-ripstop in Rainforest Green while the liner is the Maclaren Tartan Plaid pattern on Membrane 15 fabric. But I so hate purple and checked fabric! More of the sweet potato colour scheme! This quilt is with Charcoal Grey 10d taffeta for the shell and Navy 10d taffeta for the lining, saving about 25-30g compared to using the 15d ripstop fabric for the shell. The colour combo also looks great! Just wanted to say thank you for my custom filled quilt - I finally managed to test it out in Kosciuszko National Park this week. Camped at 1500 metres on Tuesday night and while I'm not sure just how cold it was it definitely was somewhere close to 0'C and I was comfortably warm. As you know I'm a stupidly cold sleeper and in the past have needed to carry a much heavier bag to keep myself warm. Anyway it performed beautifully and I'm very happy to recommend your quilts! The quilt will be coming with me for my next trip which I'm leaving for this coming Tuesday - I have a full two months free to wander along the Bibbulmun Track. Happy days! I'm glad you'll be getting some good use from your quilt Joanne. Should be a great trip! This is just what I've been looking for. I'm into cycle touring and love riding and hiking in the Snowy Mountain region. Being new to the forums I wasn't clear on how to contact you. Have registered and added you as a friend but can't see how to PM? Is it possible you could PM me please? Very grateful to Bushwalk Australia and I'm keen to follow up on this resource. Hi Pete, I got your PM. Cheers. If you don't mind me asking, which quilt did you opt for? doates wrote: If you don't mind me asking, which quilt did you opt for? I'm not sure if Joanne will have the chance to reply for a while so I'll step in. She has a -8C quilt with 100g of overfill, it's one of the early ones with the 800 fill HyperDRY duck down before I got the 850 fill and it has the sewn in footbox (it's also from before I was offering the zip and drawcord footbox). Any chance you could post a pic of one of your quilts in the stuff sack? Interested in final packed volume as I usually only run a 30L pack. Here's one I took when mine arrived. I'm sure Mike will have a better one. Thanks for that! Kinda need a pic beside a 2L milk container or similar, so i can judge how big it is. Sleeping bag (quilt) is the largest item in my bag, so packed size is probably more critical than weight in this instance. Hi Mark, here's a picture of a quilt in my standard stuff sack next to a 1L Nalgene bottle. The sack measures about 30cm long and 17cm diameter when full so about 7L volume. That said it's my -2C quilt in the bag and it can easily be compressed to half that size by pushing down on the sack (probably smaller if a sack with compression straps was used, though I wouldn't really recommend doing that). A smaller sack could be provided if desired, particularly for a +4C or -2C quilt. The theory with the standard size stuff sack is that the smaller quilts aren't compressed as much and are softer so they can be more easily squished into a pack between other irregularly shaped items. If you want to compare the ability to compress different quilts and sleeping bags the biggest factor is the amount of down. A sleeping bag with a full length larger (#5) zip with anti-snag strip on the draft tube and more fabric overall will have a bit more bulk from that but the main factor is the amount of down, quilts are more compact than bags mainly because they need less down for the same warmth. undercling-mike wrote: If you want to compare the ability to compress different quilts and sleeping bags the biggest factor is the amount of down. A sleeping bag with a full length larger (#5) zip with anti-snag strip on the draft tube and more fabric overall will have a bit more bulk from that but the main factor is the amount of down, quilts are more compact than bags mainly because they need less down for the same warmth. I am interested to know what your equivalent quilt might be and if you have any images of its pack-ability. Would love to get back to quilts if I can. Last edited by Aushiker on Tue 07 Mar, 2017 4:24 pm, edited 1 time in total. That's an interesting observation, my impression is that most quilt makers provide oversize stuff sacks because it's a bit kinder on the quilt (it will re-loft a bit faster when you pull it out and don't need to exert as much force to get it in) it can be squished in between other items in a pack and it's a bit easier to stuff it in there when packing. On the other hand larger scale manufacturers of sleeping bags are competing on packed size and provide a tight stuff sack or a compression sack to get the packed size spec as low as possible. For example EE spec their regular size 10F Revelation with a 17L stuff sack, I normally send my -8C quilt (which has about the same amount of down) with a 7L stuff sack and Sea To Summit spec their Spark III bag (which has about 10% less down) as having a stuffed volume of 3.7L in a compression sack at maximum compression. All three are made with similar fabrics, zips and down amounts and should compress to within 10% of the same size. So my feeling is that you might have simply been provided with a bigger stuff sack for your quilt when it could have fit into a smaller one. With that said I'm happy to provide a smaller stuff sack with my quilts if anyone wants to minimize packed volume. The downsides are that it will take a little longer to re-loft and it will be a bit more effort to pack it. As for the equivalent quilt to the Montbell bag you mentioned I think it should be between my +4C and -2C quilts based on the amount of down and the mummy design. I've just made a smaller stuff sack for a -8C quilt with a volume of about 5L which I think is about as small as I could reasonably go for a stuff sack with that quilt (you would need a compression sack to squish it smaller) so the -2C quilt would go in about a 4L sack and the +4C quilt in about a 3L sack. 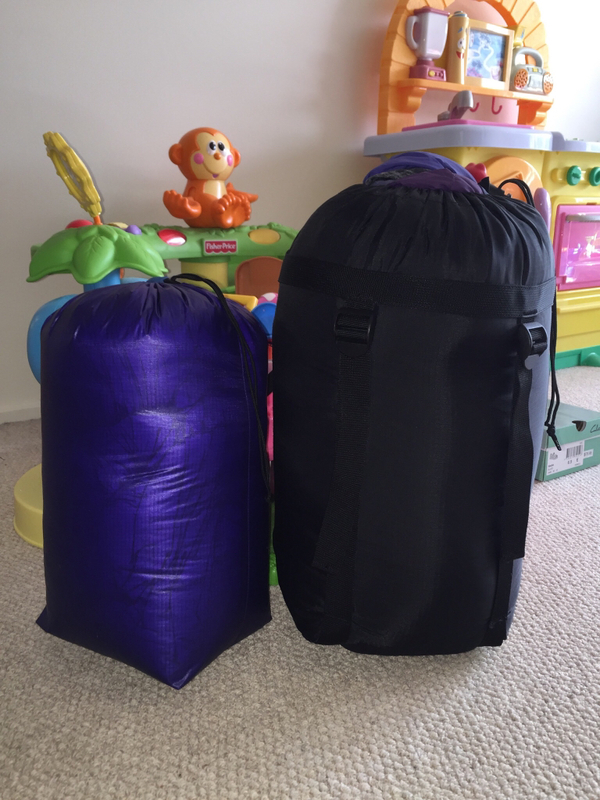 Here's a picture of my standard stuff sack (7L) next to the smaller sack for -8C quilt (5L) and a 1.25L soft drink bottle. Hopefully that gives some idea of the potential packed size. As a follow up I made up another stuff sack which is about the smallest size that works with a -2C quilt and lined it up against the minimum sized stuff sack for a -8C quilt, my standard stuff sack and a 1L Nalgene bottle. In order of size the stuff sacks have volumes of approx. 4L, 5L and 7L, the purple sack measures 14.6cm in diameter and 24cm long and the red sack is 16cm x 26cm. undercling-mike wrote: As a follow up I made up another stuff sack which is about the smallest size that works with a -2C quilt and lined it up against the minimum sized stuff sack for a -8C quilt, my standard stuff sack and a 1L Nalgene bottle. In order of size the stuff sacks have volumes of approx. 4L, 5L and 7L, the purple sack measures 14.6cm in diameter and 24cm long and the red sack is 16cm x 26cm. Thanks for your work on providing more details and images. Much appreciated. I will have another look at my current bag setup and see how it compares re the possibility of going back to a quilt, one of your quilts. Qult received today! All I can say is WOW! I am super impressed. Bring on Winter so I can give it a proper test run! Many thanks for the extra info and the smaller stuff sack, both are much appreciated. Aushiker wrote: Thanks for your work on providing more details and images. Much appreciated. I will have another look at my current bag setup and see how it compares re the possibility of going back to a quilt, one of your quilts. That's great to hear Mark! I'm always keen to hear how you go when you get the chance to test it properly. hey Mike, I am also new to Bushwalking Australia (but have looked for advice here many times. Could you please send me a PM. skipper_nz wrote: hey Mike, I am also new to Bushwalking Australia (but have looked for advice here many times. Could you please send me a PM. These look really great, as long time quilt user it is great to see them been made here. If I need a new one I will be knocking on your door to order one. I had a question mike I am wondering if you have had any demand to make slip on lightweight covers for peoples sleeping mats. It is something I have been thinking about to have top cover I can slip on my mat to make it a bit more comfortable like 20 or lighter nylon. apollo74 wrote: These look really great, as long time quilt user it is great to see them been made here. If I need a new one I will be knocking on your door to order one. I had a question mike I am wondering if you have had any demand to make slip on lightweight covers for peoples sleeping mats. It is something I have been thinking about to have top cover I can slip on my mat to make it a bit more comfortable like 20 or lighter nylon. Cheers! As for the pad cover, people have mentioned things like this in various threads and I've thought a bit about it but not put any serious effort into it yet. I'd want to figure out how to get something to fit on a variety of shaped and sized pads and avoid it moving around too much or bunching up or anything like that. One idea would be kind of like a fitted sheet with an adjustable elastic drawcord around the edge that tightens the edges under the pad, could be simple and probably could just be flat, not needing boxed corners or anything like that. Just gotta get the time to make one and test it! Could also make top sheets shaped to my quilts out of the nylon fabrics I have for the purpose of keeping the quilt cleaner. I'm interested in ordering one of your quilts.